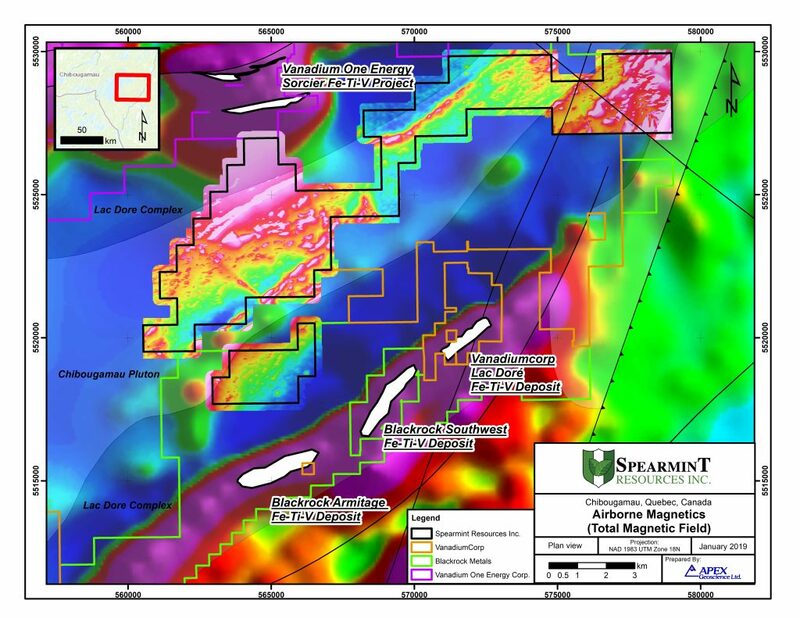 Spearmint Identifies Multiple Sharply Defined Magnetic Anomalies, Including an Anomaly Measuring 9km, on its Chibougamau Vanadium Prospect in Quebec Bordering BlackRock Metals – Spearmint Resources Inc.
During November and December, 2018, the Company commissioned Calgary, Alberta based Earth Scan Technologies Ltd. to complete drone and heli-borne airborne magnetic geophysical surveys totaling 932 line-km over an area totalling approximately 3,400 hectares at 100 metre line-spacing. The claims in part overlie rocks of the prospective Lac Dore layered anorthosite-gabbro intrusive complex (LCD), which hosts the Black Rock Metals Inc. (Blackrock) development-stage Southwest and Armitage iron-titanium-vanadium (Fe-Ti-V) deposits; in addition to the exploration-stage Vanadiumcorp Resource Inc. (Vanadiumcorp.) and Vanadium One Energy Corp. Lac Dore and Mont Sorcier Fe-Ti-V projects, respectively. Magnetite Fe-Ti-V deposits of the LCD are coincident with a strong positive northeast trending linear magnetic geophysical anomalies within both the northern and southern fold limbs of the Chibougamau Anticline. Mineralization within the adjacent properties is not necessarily indicative of mineralization present with the Company’s Chibougamau Vanadium Prospects. The results of the Company’s airborne magnetic geophysical survey define an approximately 9 km northeast trending linear magnetic anomaly coincident with the southern margin of the Lac Dore anorthosite on the north arm of the Chibougamau Anticline. A second parallel linear magnetic anomaly occurs in the easternmost area of the claims along the southern limb of the Chibougamau Anticline within rocks regionally mapped as Lac Dore anorthosite. These and other linear positive linear magnetic anomalies defined by the Company’s airborne geophysical survey warrant ground follow-up to establish the nature of the anomalies, and if they host layered magnetite-bearing anorthosite-gabbro rocks similar to those that within the adjacent Blackrock and Vanadiumcorp Fe-Ti-V deposits. Spearmint’s current projects also include a portfolio of prospects in the Golden Triangle of British Columbia; the ‘Golden Triangle Gold Prospects’ comprising of six separate claims blocks totalling 9,157 acres bordering GT Gold Corp (GTT.v), the 920 acre ‘NEBA West’ & 6,803 acre ‘NEBA’ Gold-Copper Prospects bordering Aben Resources Ltd (ABN.v), the ‘Henry’ Gold-Copper Prospect consisting of two contiguous claim blocks totalling 1,989 acres in the direct vicinity of Golden Ridge Resources Ltd. (GLDN.v), and the 21,587 acre ‘EL North’ Nickel-Copper Prospect is a contiguous land package of six claims in the Eskay Creek Camp bordering Garibaldi Resources Corp (GGI.v). Spearmint’s other projects in British Columbia include the ‘Gold Mountain Prospects’ comprising of three separate claim blocks totalling 1,245 acres bordering Barkerville Gold Mines (BGM.v), the ‘Safari’ Copper-Gold Prospect consisting of 9,007 contiguous acres located in the northern Quesnel Trough in North-Central BC directly bordering Serengeti Resources Inc. (SIR.v), and the ‘Hammernose’ Gold Prospect consisting of 5,140 acres directly bordering the strategic alliance between Westhaven Ventures Inc. (WHN.v) & Sable Resources Ltd. (SAE.v) in the Spences Bridge gold belt located in Southern British Columbia, Canada.